Each year, hundreds of fishermen in Stonington throw over thousands of traps in hopes of another successful lobstering season. Attached to those traps are tags, which indicate the fisherman it belongs to. Sometimes those tags fall off, due to strong currents or a curious marine animal, never to be seen again. Sometimes, those tags make a journey thousands of miles and turn up on a beach in an entirely different country. Such was the case about six weeks ago when West Sussex, England resident Helen Frost was combing a beach in search of items to incorporate in her artwork. Between the usual shells, rocks, and sea glass, Frost found something unusual. 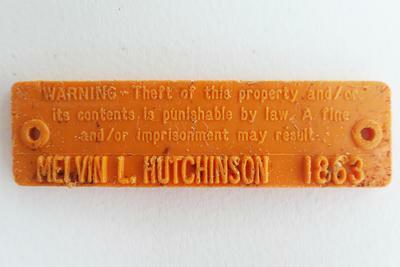 What she found was an orange fishing tag, belonging to Melvin Hutchinson of Stonington. Frost picked up the tag, which had Hutchinson’s name on it, and put it in her “treasure bag,” she said, and as she investigated it later she decided it was an item worth researching. A few internet searches connected her to a photo of Hutchinson from last year’s Fishermen’s Day event, at which time Hutchinson was inducted into the Hall of Fame. Frost was also able to connect with his daughter Kristy, at which time it was determined she had found the Melvin Hutchinson the tag belonged to. “What I find fascinating is that most people who even noticed it, would have just walked on by. A few might have seen it and put it in the bin and a few less would have recognized what it was, but how many I wonder would have researched it? It’s what I enjoy,” said Frost. For Hutchinson, the tag being found was not a surprise. Hutchinson said he has “not a clue” which trap the tag came off of, or even what year it could have happened. The tags do not have a date on them, only a name and identification number specific to the fisherman. The Stonington fisherman, who is one year shy of 80, has been fishing the waters in the area for almost 50 years commercially, and almost 20 more years before that as a boy. He said his best guess is that the tag came off one of his traps when he “still had wooden gear,” almost 30 years ago.